It was a very windy start to our day, the majority of us were worried our tents would blow down during the night as it was quite blustery! 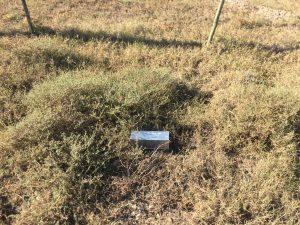 Those who were checking rodent live traps this morning were up at 6:00am and the rest of us lazy ones got up for 6:45am. After a quick breakfast of cereal, yoghurt and toast, we all headed up to the classroom to set up our stations for the day. 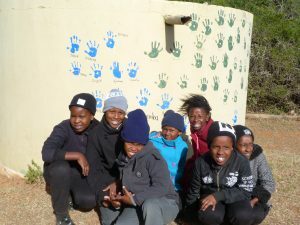 Children from local schools were coming to Amakhala for World Environment Day which happened to also be World Oceans Day. 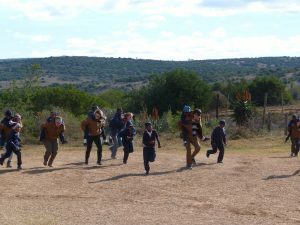 It was a wonderful time and the children were all excited running around, jumping on our backs, laughing and giggling. We taught the children about ocean animals and how to keep the oceans clean. 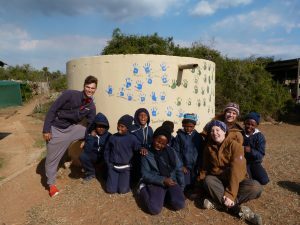 Afterwards the children had their hands painted blue to place a handprint on the water reservoir as a promise to keep our oceans clean, save the animals and pass the word on. We then played games and danced around with the children., some of them were chasing Megan around and shouting: “Mama” and “Baby”. Mama is a sign of respect to an older female person. It was really adorable, but they loved us too!! 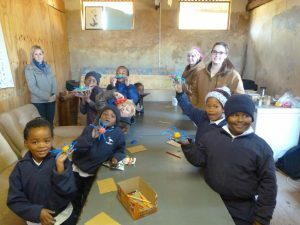 As a thank you, Amakhala provided spectacular calendars to each of us and these were given to us by the children. Soon after that we waved good-bye to our new friends as they drove back to school. 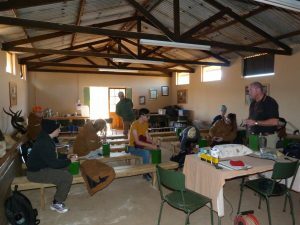 After lunch we had a couple of lectures by Dr. William Fowlds on “a day in the life of a wildlife veterinarian” and another on Rhino conservation and anti-poaching. It was very eye-opening to see how much of a problem rhino poaching is just for the sake of the horn!! After 2012 over 3500 rhinos were poached, it is not just rhinos being poached but other wild animals such as lions and tigers for their bones, and elephants for their tusks. When these animals are all gone, where will it stop? It is not enough to just protect the animals and try to stop the poachers, we should be showing the consumers of the products what they are doing to the animals. There are a lot of videos online about this topic and if you are interested in saving a rhino’s life watch these videos, get educated, become aware and get involved!!! Lets save these magnificent animals from extinction!!! We ended the day with a lovely meal provided to us by the staff at Amakhala and shortly after we were heading off to bed for an early night. Good night everyone, Jessica! Stay safe and healthy. This morning our entire group looked like zombies when we woke up due to the fact that the wind was blowing so hard last night that our tents were shaking. We were up for six to checks he sherman traps to see if there were any rodents in them. We caught two different species of rodents, a veil rat and multimammate mouse. After checking the rodents, we released them, and headed up for breakfast. During breakfast, I decided to take a nap at the table, but not long after moved to the couch in the common area where Ashley and I took a team nap. After the little bit of rest that we got, we went for a lecture. The lecture this morning was on the impacts that elephants had and have on the vegetation over 10 years. 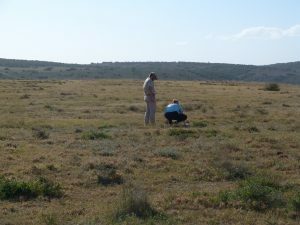 It was given by Gareth, who does his research on the vegetation of different game reserves in South Africa. 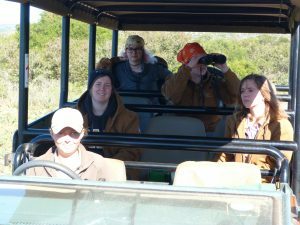 After the lecture, David, Janine, Jessica, and I went on a drive throughout the reserve with Simone to collect some data for our projects. This experience was a bit tougher than I thought it was going to be, as collecting poop is a time dependent activity, due to the fact that shortly after it hit the ground, it bakes. So finding fresh stuff was difficult. 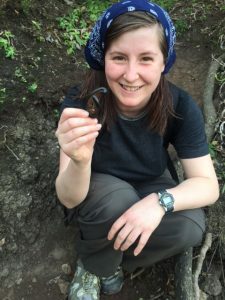 While Maddie and Lenka were searching for herps (not what you might think), amphibians and reptiles; Ashley and Nikki had checked the Sherman traps. Everyone got a start on their projects’ making it a very productive morning, and eagerly waited for lunch, and then got back to our research. After lunch, David, Ashley, Nikki and I were on “poop patrol” and went back out to the reserves to collect samples. Practice makes perfect because this time, poop was dropping and we went running when Simone deemed it was safe. We saw an elephant who thought she was separated from the parade, because she was on the other side of the river. 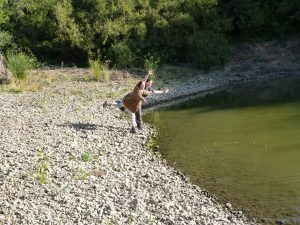 She was running and calling for them and had to cross the river to be reunited. It was an great opportunity to experience elephant socialization. Lenka, Maddy and Jess collected information for their research projects. We then all got together to discuss tomorrow, which will be very exciting so you’ll have to stayed tuned to hear more about it! Poo Patrol on the job! And they return victorious, bag in the hand! The most exciting day ever!!! The day started with a 6:00am wake-up call that came too early. This will only be getting worse due my project and having to check live Sherman live traps before breakfast time for the next week and I will have to be checking my traps at 6:00am. This morning in particularly was exciting as we would be going to a game reserve to see a white rhino darting, in order to update the radio collar and batteries. The overall process of getting a quick orientation from the wildlife veterinarian, finding the correct area and then darting the animal successfully took around 3 hours. In South Africa there are a lot of issues with poaching so the details of this experience are meant to be kept vague. This was an experience of a lifetime and not something that I will probably ever get the opportunity to do again. The exhilaration of being so close to such a powerful animal made me speechless and I felt like I was in the presence of a celebrity. The words to describe this do not give the memory any justice to what anybody from the group was experiencing. At lunch we had a new food nobody had tried before called umgqushu, it is called ‘samp and beans’ in English and is maize cooked soft with kidney beans. It was amazing in my opinion, especially with some chutney on top to add some sweetness too it. As soon as my belly was full Dr.Gray took me out to the two sites near the classroom for checking the Sherman live traps as to help orientate me with how to check them and identify the mice correctly. The site checks led right into the lecture time with Mark Palmer, the manager of the Amakahala Game Reserve, where we discussed the topic of managing animal population on small reserves. It was very enlightening to know how much of a balancing act it is with the vegetation, herbivores and carnivores to keep an ecosystem successfully function as well as keep the economic side of the reserve to support the animals. It is a fine line between tourism and conservation. The lectures lasted around 2 hours before we had to head to our secret location on the game reserve and to do our 4:30pm live Facebook feed for all of our lovely family and friends. Hopefully everyone enjoyed the view on top of the ridge and introduction to our projects. However on the way up we caught a lucky siting of 3 white rhinoceros one of which was a calf. It was quite exciting to see so many spectacular animals in one day. 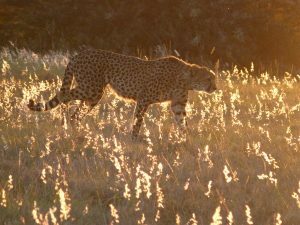 Just after the live stream the two vehicles (Toyota land cruisers) drove to a cheetah sighting. The entire group saw 5 cheetahs which included 4 cubs and their mom. The sun was just setting behind them so the light hitting them was breathtaking moment. The cubs were play fighting with one another and sneaking up behind their siblings as their mom was slightly ahead standing watch. 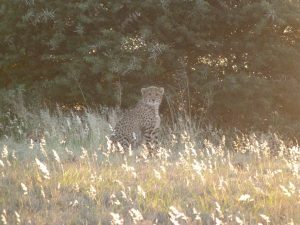 The day was very exciting one from the moment we woke up because we can all say now that we have seen 4 out of the 5 from the Big 5 list , the leopards have being very shy since we arrived. Mommy, mommy where are you? The group including Janine and Sarah had a very tiring but full day of amazing events and we will be back at it bright in early tomorrow morning to explore our surroundings even more. Ashley out for now…hope you enjoy our day as much as we did! This morning starts off with my roommate, Megan, jumping out of bed – we had accidentally slept in and were late for breakfast. Once we actually made it to the main lodge, we had a good breakfast and much needed coffee. Our first lesson of the morning was on the back deck that overlooks a beautiful view of the reserve. Dr. Dan Parker had set up a songmeter last night and was teaching us how to read the data. This equipment is used to record the echolocation of bats, once triggered by a sound over 20 kHz it records the sound for a maximum of 5 seconds. We then can analyze the results on the computer software. This is a really neat device that has a range of 50 meters. When we did analyze the output we could only find a recording for one bat call. There was a lot of noise from the kitchen last night, and lead to a number a lot of false recordings. The bat we did identify was a Cape Serotin, that has an echolocation of 40kHz, they have a modified echofrequency that resembles a hockey stick. 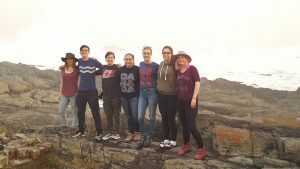 On of the students may complete their research project on bats, which would be a lot of work, but an interesting topic since we have few bats left in the maritimes. Our second lecture of the day was by Dr. Parker, was on the topic of our research project designs. He went through the scientific processes and what kind of statistical analysis we may select from. I am planning to do my project on amphibians and reptiles, since I am very passionate on them. I can’t pass up the opportunity to learn more about these African species. Nikki set up her project today, which will be focused on camera trapping along animal highways. So we all took part in testing and setting out the trail cameras. 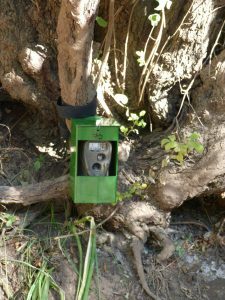 For those who may not know, camera traps consist of these little camouflaged cameras with a white flash and an infrared beam. When the beam is broken by a passing animal the camera will take a picture, this is a great way to count nocturnal animals. We spend most of the day completing this task, seeing multiple species along the way. 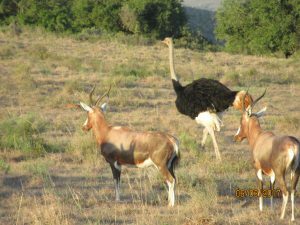 Dazzels of zebra, sounder of warthog, congregation of baboons, herds of eland, kudu, blesbok, red hartebeest, black wildebeest and numerous species of plants & birds. 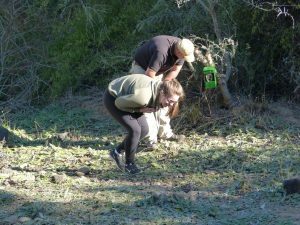 Some students even stopped to pick up dung, for their research projects (namely David & Megan) this is called being on poop patrol. 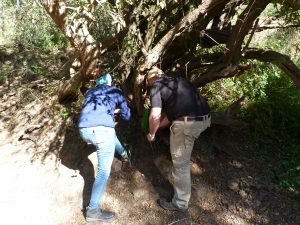 Once we got back to camp in the late afternoon we got a hands on lesson on how to set up Sherman live traps to examine the diversity of small mammals for Ashley’s project. We will be up extra early tomorrow to identify and release any small mammals caught. 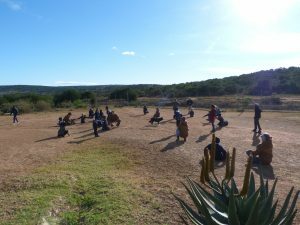 Our AWE adventure continued bright and early in the morning at Addo Elephant National Park. We met up at Janine, Sarah, and Dan chalet for just a quick breakfast for some of those who aren’t big breakfast people or for a larger breakfast for those who desire a larger breakfast. 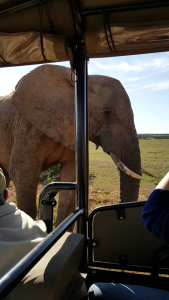 This was our last morning in Addo and we packed up the van for our last drive through the exceptional Addo Elephant National Park where we’ve seen hundreds of elephants. As we drove through the park we saw some species we hadn’t seen in the park on our previous drives. 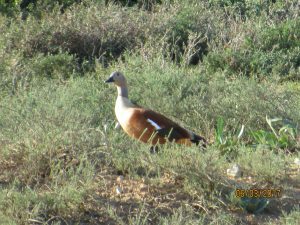 For example, the South African Shelduck with its beautiful colours was spotted as well as a male bushbuck that crossed the road in front of us. We came upon another watering hole along the dirt road and saw a beautiful parade of elephants come by close enough to see into their eyes. This family of elephants differed from the others we had seen because it had the youngest baby calf we had seen which was naturally quite adorable. 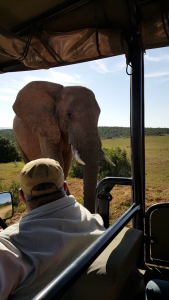 We then came to the end of the road and the end of Addo Elephant National Park for us however, unforeseen problems have their way of disrupting careful planning. As we came upon the gate Dan spoke to the security guard who informed him that we were not permitted to exit this gate of the park and we had to go back the entire way we came to exit another way. He did not offer an explanation as to why. This was a problem for three reasons: 1) The delay would have made us late for our arrival at Amahkala, 2) the van had a trailer with all our luggage making it impossible to turn the van around without removing the trailer which would violate the rule that you must stay in the vehicle at all times for safety reasons, and 3) Nikki was very nauseous due to motion sickness and would not be able to drive back the way we came without vomiting. The security guard told us flat out “no” and when questioned he called for his supervisor to come to the gate to speak to us which took 20 minutes. When the supervisor arrived he also told us explicitly “no”. Dan then, with some strategic rhetoric, told the guard that we were taking Nikki to the hospital. Once the guard confirmed there was someone in the car not feeling well he allowed us to continue our journey. 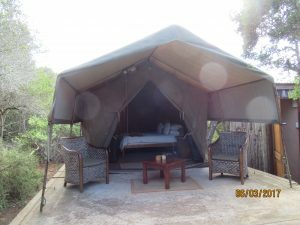 After a short drive the we arrived at Amahkala game reserve Woodbury tented camp, a private game reserve where we will be spending the rest of the course until we return to the great white north. 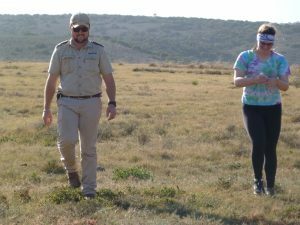 Jennifer and Giles Gush run the Woodbury tented camp and they are one of four founding families of the Amahkala game reserve. 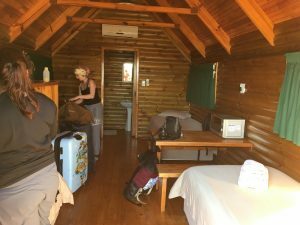 We were checked in and shown our lovely tents which nice furniture, bathroom, and heated blanket for the cold nights. We were served a delicious chicken, ham, or vegetarian sandwich lunch with fruit before going on our first game drive in Amahkala. This game drive was game changing so to speak. To begin, we quickly saw and moved fairly close to a southern white rhinoceros which was an incredible experience. Seeing the massive animals all one can think of is how much danger these animals are in from poachers looking to kill them for their horns worth more than gold. 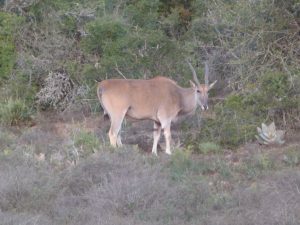 We then saw some kudu, impala, and other antelope. As the sun set on this already incredible game drive we saw Amahkala’s four lions; an adult male, adult female, and two sub-adult females. We saw them on a hillside lying in the sun and we all marveled at the incredible animals. At one point an impala was walking directly towards the lion in cover of some bushes and we were hopeful that we would be so fortunate to see a kill but the sun fully set and we had to move along. Next, we had a wonderful supper with chicken in a delicious sauce over rice with a Greek salad and porridge cake with custard for dessert. The porridge cake with custard was new for most of the students but we were all eager to try new foods and the cake was delicious. Dan Parker then gave a wonderful lecture on carnivores and how local farming operations kill the black backed jackals to manage their population in order to save their sheep and goat herds. However, the data suggests that this practice of culling the jackal actually increases breading in the animals therefore not reducing their numbers to the predicted levels. We then all went to bed promptly as we were all tired from the many full days of incredible South African wildlife sightings we’ve had. Today we woke up at 5:30am, still in Addo Elephant National Park, to go for an early morning game drive in our van and we saw a few of the same animals BUT also we saw a spotted hyena!! Janine was pretty jealous that she didn’t come with us. I (Lenka) did not go on the drive but when I got up, I found that Nikki and Ashley had locked our Forest Hut and taken the key…I had to climb out the window to escape! On our way to breakfast, we saw 3 vervet monkeys climbing around in the trees! While eating breakfast, Janine messaged us that there were “phones in front” (code for lions walking right by the waterhole – through autocorrect)!! So we all jumped out of our seats and ran down to try and see them, but sadly we missed them. After breakfast we went for a ‘real’ game drive in the open window Landrover and had an amazing time! Sadly almost right way, we got a flat tire and had to wait for someone to come with another vehicle; but thankfully it wasn’t in a dangerous area. After we got into the new vehicle we went down to the watering hole and there was a parade of elephants’ drinking water and shortly after another parade joined them. A bunch of zebras, showing off their butts to us, stood watching the elephants drink. On our way back, an elephant came right next to the vehicle, so close I could’ve touched her! It was certainly the highlight so far for Megan, her face was in utter shock, she was so happy to see her favourite animal close like that! We even saw a buffalo grazing right next to the vehicle, which was super interesting to watch it eat that close up. After lunch we went for a walk along a path in the National Park and to a Bouma where we saw an angulate tortoise and buffalo! We got a bit of free time today to do some laundry and catch up on some of our work, so some of us went to sit down in the underground hide to see if any animals would come to the watering hole. There was an elephant and her mother that passed by quickly to drink some water. After our free time, we had a lecture given by Dan and his masters student, Gareth, about the impacts of elephants on vegetation and wildlife. Honestly, all the lectures we have had so far have had a large impact on us, but this one sparked a very nice discussion about what we can do to solve these issues with elephants while keeping everyone happy and still be considered ethical for the animals. It was such a good discussion between us and it went on for so long, we decided to head for dinner and continue our discussion at the dinner table! We ate dinner at the Cattle Baron restaurant tonight, it was a very nice meal. EXCEPT we decided to get dessert and two of the cheesecake slices we ate tasted very, uhm shall we say, tangy and like expired milk. Everyone tried a bite and the taste stayed with us all night – the memory of that cheesecake will haunt those who tasted it forever. It did, however, make for a very nice laughing fit between us and a funny memory. 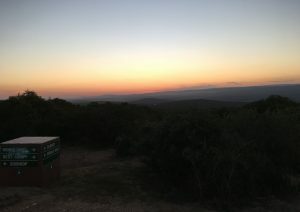 We got back to our cabins around 9:30 at night, and all wrote in our field journals for a bit before deciding to hit the hay pretty early to get a good start on the next day because we are heading to Amakhala Game Reserve. This comes compliments of Lenka Wicha. Quite the big day today!! We-packed our bags to head on over to Adoo National Elephant! The big day was finally upon us and we were heading towards the Africa that we all have been dreaming about and imagining since we were young. After a quick breakfast and a faster shopping spree at the Camp’s gift shop for ALL OF OUR DEAR SUPPORTERS BACK HOME we hit the road! P.S. it is extremely hard to take a decent picture of everyone without at least one of them having their eyes closed, or in whatever facial expression David is displaying here for us. All in all, the drive took 3 hours. 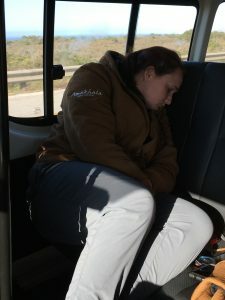 Still quite jet-legged, some of us slept for a while (including Ashley here and myself for a while!) but most of the drive was spent discussing, laughing, singing (Thanks Dan! ), intertwined with a lot of “Ouh! Ouh! Ouh! LOOOKKK! A MONKEYYY!”. 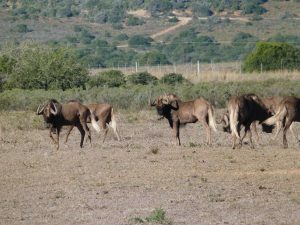 And indeed we did see Vervet Monkeys, amongst multiple other species such as Jackal Buzzards, Ostriches, a Secretary bird, and multiple types of ungulates such as Kudus, Red Hartebeest, and Elands. You know you’re not in Canada anymore when you see signs on the side of the street that write: ” Seekoel”, meeting hippopotamus! What always surprises me is how much some of the scenery can look like Canadian agricultural lands! When you see cows, sheep, goats, and horses roaming around you really remember that nowhere is really that different from home. 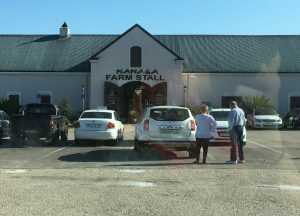 We stopped for lunch at Nanaga Farm Stall, where we experienced meat pies (or spinach and feta for the veggie eaters) and Roosterkoeks which are breads similar to panini breads back home filled with whatever you want. Personally, I had the butter, cheese, and tomato option. It was absolutely delicious. It is worth mentioning that we had a chicken roaming around free as we had our little lunch picnic! 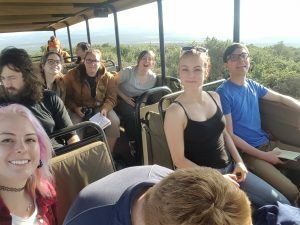 We unfortunately do not have a picture of him, but on our arrival to Addo we had a lecture from John Adendorff, the conservation manager of the National Park. We had a very nice conversation with him about what managing such a complex ecosystem entails, and the complications that can occur with both the animals and the public. As always, our guest lecturers are as interesting as they are eye-opening. 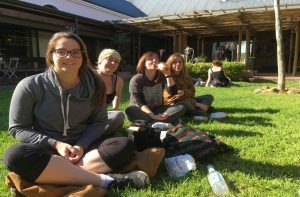 After the lecture, we were released to go explore our new living accommodations and to settle in our 2-day home. One hour later, at approximatly 4:30, we went on our first Game Drive! This was potentially the most exciting part of the course as of yet because we got to see hundreds of the one mammal we were so anxiously waiting to see: Elephants! 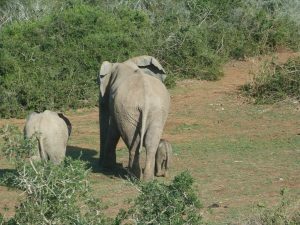 As we drove along the South African thicket and grasslands, fields of pachyderms openned up to us. For us, this was the real Field of Dreams. We cannot, however, forget or undermine the importance an excitement that came with every other animal sighting. 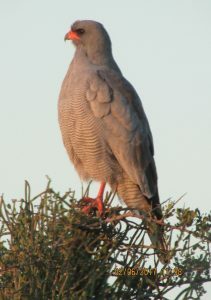 We gazed amazed at birds and ungulates of all types for a good hour before coming back “home” for a Braai (BBQ) before bed! 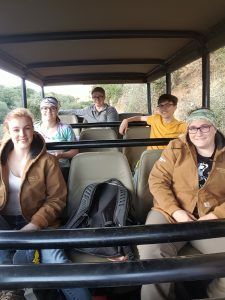 Here are some pictures from the game drive! We started out the day on time for once. To Janine’s dismay we actually arrived 5 minutes earlier than expected. For breakfast she was half asleep and in her pajamas looking a little grumpy. She warned us ‘no-one talk to me until I’ve had my cup of coffee’ so I took that to heart and stayed out of her way until she got some breakfast. 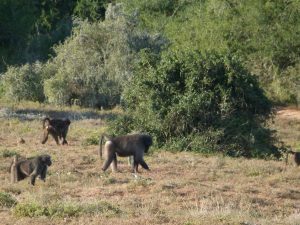 I went out onto the patio just to take a look at the scenery and I had to look twice because I didn’t believe it at first, there were three adult Savanna baboons (2 female and 1 male) each carrying offspring on their back. So I rushed to the patio door and told the rest of the group to come out and see them. We watched them run up behind the little trail behind the cabin. After breakfast we went to the cabins to pick up some things students needed for the day. When we got there we saw baboons rooting through the trash looking for food and Dan had to walk us to our cabins to collect our stuff. Following this, we went to the conference centre to listen to a lecture by Kyle Smith, a marine ecologist at the Garden Route National Park region, who spoke to us about the research they were doing on adaptive strategic management of the marine resources in the Garden Route National Park’s marine protected area. He talked about the depletion of fish through fishing and how protecting these areas has increased the numbers fish and fish species. He said ‘at the moment we transform the world but we don’t monitor it’ which I think he meant we are changing the world without realising the consequences of our actions. I found this talk very interesting because it opened up the idea that conservation of one species can be to the detriment of species. As we helped carry out his monitoring equipment, Dan spotted some bottlenose dolphins and showed them to Maddie and I. We got the rest of the group to show them the dolphins, everyone was very excited seeing them. After a delicious lunch of chilli burritos we packed up for a hike to a waterfall on the Otter Trail. As we walked to the beginning of the trail, we saw a number of different species of birds that we hadn’t seen before. We saw another Knysna turaco which is a pretty green bird as well as a millipede which is called a Shongololo here. 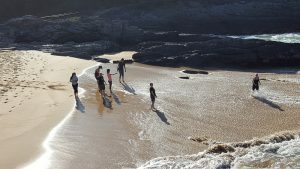 The hike was a long walk along the rocks on the coastline and was difficult in places but it was worth it when we finally got to the waterfall. There was a pool at the bottom of the waterfall and the whole group decided to take a swim. We put one foot in the water and it was freezing! But we went in anyway because we wanted to say we had done it. When we got back from the hike and we went to dinner at the restaurant where we celebrated Lenka’s birthday with a lovely meal and a cake. We ended the day with a fireside discussion reviewing the first 2 days of the trip. This is the post from Jessica Gill until the next time. Swimming in the waterfall pool on the Otter Trail!! 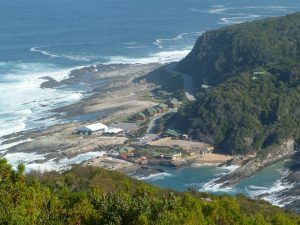 Today, our group woke up at around sunrise to head for our first breakfast at Storms River Bridge Rest Camp. We had arranged to have breakfast in the instructor’s cabin with the food that we bought the day before. After waiting for our instructors to pick us up, we realized that they were also waiting for us to walk. We started to make our way to them when Dan pulled up and drove us the rest of the way. We ate our breakfast, and observed the wildlife on the costal front from the decking of the cabin. After breakfast, Dan gave us our first lecture on forest birds. We learned a lot about the South African forest, as well as the different species of birds that exist in it. After the lecture, we headed off for a beautiful hike in the forest. It was a perfect day for a hike as the sun was shining and the slight breeze kept us all cool. We followed the Storms River “Mouth Trail” through the beautiful forest. Along the way, we listened and watched for wildlife. 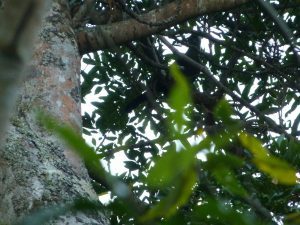 We got our first sighting of a Knysna tauraco and then spent quite a while watching a group of dassies (rock hyrax) sunning themselves on tree branches. 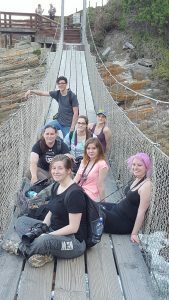 We crossed a suspension bridge and once on the other side decided that it would be a good idea to hike four miles to the lookout point at the top of the mountain. To say the least, we all got enough exercise to make up for the two days of sitting in the airports. The view at the top of the mountain was well worth it, as we were able to see whales off in the distance in the ocean. As our group was absorbing the view, a crowned eagle had circled around right above us. Even Dan said “I even got a little excited over that”. We took our last photos before heading back down the mountain, observing more lizards, geckos and bird species. 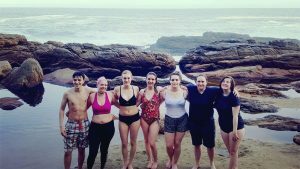 Although the trip down the hill was a lot easier, we were not any less sweaty, which called for a feet dip in the Indian Ocean to cool off (or in Lenka’s case, a complete polar dip). We made delicious chilli for supper, and headed back to our cabins for the night. On our hike…at the beginning we crossed a suspension bridge and then walked to the viewing point at the top of the mountain (that is our camp site at the bottom), followed by an exhausted group of hikers resting on another suspension bridge after coming down from the viewing point on the way back . A quick dip in the Indian Ocean to wash off all the sweat from the Hike. That’s all for now, Megan Wynn! Again, we felt much better with food in our bellies. It was during that lunching that we met our South African prof, Dr. Dan Parker. That is where the hilarity ensues and where I leave this blog for my fellow AWE friends to continue. Stay tuned for funny stories, adventures and beautiful views of our time in South Africa, thank you for reading and keep following us from Maddie. And now it is my turn, Ashley to share my experiences. Today, was the last travel day for the AWE group as we landed in Johannesburg, South Africa. The long 11 and half hour flight was very taxing for everyone. The next stop, as we wandered through the airport, was to meet Dr. Dan Parker from Rhodes University at a restaurant called Jacksons. He was taking the next flight with us. Dr. Parker is very interesting and I found him to be quite funny as well as very knowledgeable. The meal was refreshing after having plane food. It was exciting to know that there was only one more flight, to Port Elizabeth, at 11:10 am lasting a wimpy 1.5 hours, comparing it to the pervious 11.5 hour flight. 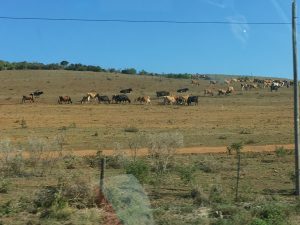 After our meal we departed for Port Elizabeth, it went without any problems and we landed to a lot warmer weather than the group expected, South Africa is in winter at the moment. The sweating started right away, I must admit I was quite happy I was wearing a black shirt so it didn’t show as badly. 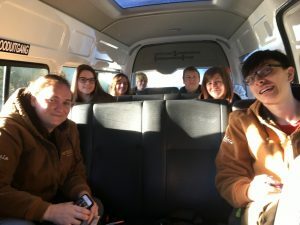 The group then headed to the van to pack up all the luggage for the trip to Storms River Bridge Rest Camp, 2.5 hours away, with a quick pit stop to the grocery store, Pick ‘n Pay in the Walmer Park Shopping Mall. Around 20 minutes before the camp we stopped at the Storms River bridge rest stop where we tried different types of biltong: kudu and beef. I would definitely not mind having this dried meat in Canada as it was much better than beef jerky. The first taste of South Africa never tasted so good. The view off the bridge looking down the gorge was amazing and a breathtaking moment to what was to lie ahead. The last 20 minutes of the drive made me realize where I was and the excitement of the trip started to set in. The arrival at the camp brought us right to the coast of the Indian ocean with cabins scattered across the shoreline. Dan then drove us down to where we would be staying, a little bit further into a forested area. 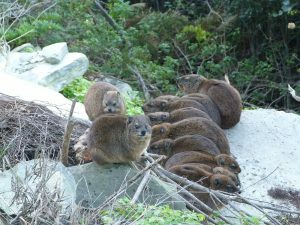 We first stopped at the restaurant-reception area where we saw our first wildlife, the dassie (rock hyrax), which is the closest living relative to the elephant (strange but true as it is the size of a groundhog). The group got out and picked roommates for the next 3 nights so we could finally get a hot shower. I really did feel bad for the rest of the group as the long travel had made my deodorant rather ineffective at making me smell normal. I called first shower as we figured out where our cabins were but my roommate Jessica didn’t mind too much, I think she was being polite. After everyone settled in, the group waited for Dan to arrive. The majority of us were ready but as everyone waited in the van for Maddie and Megan we noticed only shadows through the window. I think around 10 minutes passed before they emerged victorious over their cabin door. They had apparently locked themselves in and couldn’t get the door open. Even after emerging they had some more trouble locking the door again. It was probably the exhaustion from the long travel kicking in. The girls hopped in so Dan could drive us over for supper and we gathered at the restaurant called Cattle Baron around 7pm within the camp. Dinner was filled with interesting conversation and fantastic food, I had the best burger I had ever eaten topped with an egg and avocado. The rest of the night after dinner was getting ready for the adventure to follow the next day, a day of hiking. The sound of the crashing waves surprisingly were very soothing and we all fell asleep with little difficulty! That’s it from me, Ashely Tait until the next time! 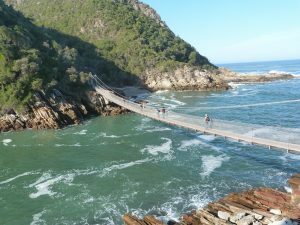 At Storms River Bridge Rest Camp.